Kik made waves last year after a successful $100 million ICO. Now the company has released its first beta product related to its Kin token. Called Kinit, it’s a simple wallet that enables users to earn, store, and spend its tokens. “Kinit is a fun, easy way to earn Kin, a new cryptocurrency made for your digital life. Earning Kin is just like playing a game, only better, because you get rewarded for completing fun daily activities like surveys, quizzes, interactive videos and more,” reads the Google Play Store description. You can download the app for Android here. The Kin token is unique for a few reasons. First it is not a traditional ERC-20 token and is instead uses Ethereum for liquidity and the on the Stellar network to improve transaction speed. Further, the company is spending a great deal – about $3 million – to get developers to develop on the token through its KinEcosystem site. The Kinit app is the first effort to get normal users to adopt the tool. The app makes it possible for users to generate a few dollars in value per day and then exchange those dollars for gift cards and perks. According to CCN, Kik has created a product without a business model and instead it wants to drive the adoption of the token through giveaways. “Kinit is the first publicly available app dedicated to Kin. Our goal with Kinit is to get Kin into more consumers’ hands. It’s a major step towards making crypto truly consumer-friendly through fun and engaging experiences, and we plan to learn and iterate based on real-world user behavior. We’re excited to get even more people earning and spending Kin — all on the Kin Blockchain,” wrote Rod McLeod, Kik’s VP of communications. The app currently asks you to complete surveys in order to get discounts and gift card codes for products. With the rise of the product-less ICO it’s clear that Kik has the right idea. By encouraging usage they drive up the token price and token velocity and by launching a general beta full of cutesy imagery and text they are able to avoid the hard questions about developer adoption until far into the future. While the KinIt app is probably not what most Kin holders wanted to see, it’s at least an interim solution while the team builds out sturdier systems. It’s difficult to show people that you love blockchain. There are no cool hats, no rad t-shirts, and no outward signs – except a libertarian bent and a poster of a scantily-clad Vitalik Buterin on your bedroom wall – to tell the world you are into decentralized monetary systems. Until, of course, the Bitcoin Genesis Block Backpack. Unlike the blockchain, this backpack will centralize your stuff in a fairly large, fairly standard backpack. There is little unique about the backpack itself – it’s a solid piece made of 100% polyester and includes ergonomically designed straps and a secret pocket – but it is printed with the Bitcoin Genesis Block including a headline about UK bank bailouts. In short, it’s Merkle tree-riffic. The green and orange text looks a little Matrix-y but the entire thing is very fun and definitely a conversation starter. Again, I doubt this will last more than a few trips to Malta or the Luxembourg but it’s a great way to let Bitcoin whales know your ICO means business. The bag comes to us from BitcoinShirt, a company that makes and sells bitcoin-related products and accepts multiple cryptocurrencies. 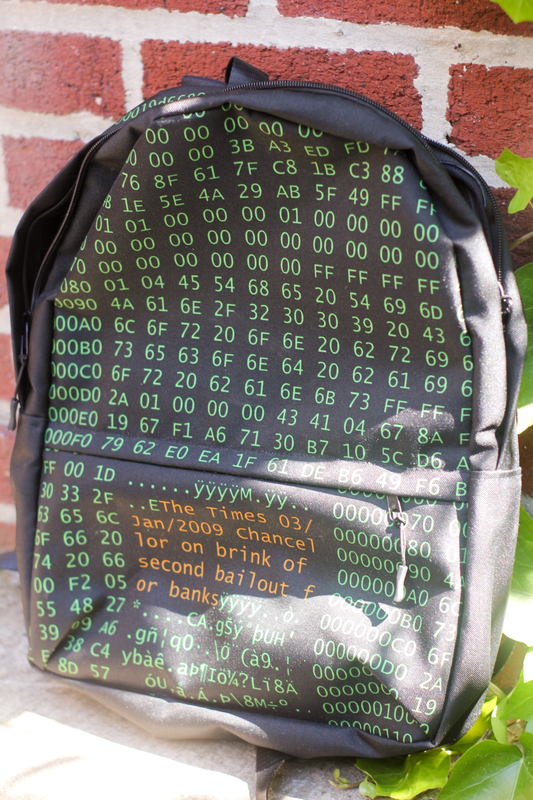 While this backpack won’t stand up to 51% attacks on its structural integrity, it is a fun and cheap way to show the world you’re pro-Nakamoto. So as we barrel headlong into a crypto future fear not, fashion-conscious smart contract lover: the Bitcoin Genesis Block backpack is here to show the world you’re well and truly HODLing. To the moon! Read other Bag Week reviews here.